Spectacular Telluride Mountain Village Luxury Home. Location: 106 Singletree Ridge, Telluride, Colorado, 81435 (on the Telluride Mountain Village Golf Course, only a few blocks from the Telluride Ski Area). Free shuttle service to all areas in the Mountain Village including the Ski Area and fine dining. Free gondola to Town of Telluride. There are five bedrooms (three master suites with king beds and two bedrooms with queen beds) plus a full sized futon in the main loft and a king size bed in the upper loft. There are four and a half bathrooms. Designed by an award-winning architect, this spectacular, 6655 square foot home boasts 360-degree views of the surrounding San Juan Mountains, with a sweeping panorama that includes the three fourteen thousand foot peaks in the Wilson Range, Sunshine Peak and the entire San Sofia Ridge Mountains above Telluride. The siting of the home takes full advantage of these views with its abundant use of glass and spacious open design. In addition, over 1900 square feet of decks and patios wrap-around the sunny side, to bring the outdoors into the home. You can see four complete holes of the Telluride Golf Course, tee to green, as well as a major portion of the Telluride Ski Area, from the Gondola to Gold Hill. With over 300 days of sunshine on average per year in Telluride, you will enjoy long sunny days and spectacular sunsets. Not to be outdone by its surroundings, this home’s many unique features make it a truly spectacular and fun place to live. With superb stone and wood finishes, high-end appliances and fixtures, this incredible home includes: a live 35-foot black olive tree inside the home, a 38-foot fireplace structure with two fireplaces, an expansive 8-foot by 95-foot skylight system, custom cabinetry, an awesome sound and video systems (over 60 speakers), and many other special features. This home is truly a sport-person's retreat with the ski area only a few blocks away, the golf course right next door, a Home-Owner Association's private tennis court about 200-feet away, and lots of mountain biking and cross country ski trails out your back door. Within the home is a large athletic room that includes a golf driving range, a tennis practice area, and Ping-Pong table. The family room includes a beautiful 8-½ foot Olhausen pool table and gas-burning fireplace. The upper loft includes a futon and reading area. There are two large indoor jetted hot tubs, one 7 person outdoor hot tub, and four showers, two of which are steam showers. - beautiful custom cabinetry as well as outstanding views of the San Sofia Ridge. This home has also served as a corporate retreat and business meeting center with its large dining room table that can also serve as a 16-seat conference table. This is a 'non-smoking' home and no pets are allowed. Additional midweek cleaning and catering services are available at renter's expense. The above information is deemed reliable but may be updated at any time. Some photos are old and we have made improving changes since they were taken. We try hard to keep everything in top shape. toilet, shower, jetted tub, double vanity, two toilets, 2 person hot tub and 2P shower! The #1 master bath is huge with an adjoining walk through closet. There is a massage table and linens stored in this closet. The lower two master suites both have walk-in closets and adjoining baths. (6) local calls only. Bring your cell phones. not needed at this altitude. It is all in-floor heating; very cozy and warm. 2 washing machines and 2 dryers; one set on main level and one set on lower level. Room to park six cars. There is a covered drive through area big enough for 2 small cars. No Garage. High speed cable Broadband with access code. Most beautiful living room in the Telluride area, surrounded by a 1000 square foot deck. The views are spectacular! Full sized SubZero fridge, side by side with SubZero full sized freezer. Huge 6' wide cooktop with six burners and an thermadore double grill. Two full sized Dacor ovens below. 6' Vent-A-Hood above. (2) 2 large microwaves, both with turntables. 4 coffee makers: one espresso, 2 drip, and 1 electric perk (for tea or coffee). Large 6' double door pantry with cooking basics: flour sugar salt pepper, spices, etc. Place settings for 18+ guests. Double island kitchen with awesome views. Clean-up island has huge double sink. Food prep island has small sink. Main dining table seats 12-16. Additional granite breakfast nook table seats 6.
televisions in all bedrooms. New in November 2012: Samsung 55' LED HDTV and 46' Samsung 3D smart LED HDTV with Blue ray 3D player. High speed cable for both TV and internet. awesome stereo system with over 60 speakers throughout the house. 2 regular DVD players and one blue Ray 3D player. 4 areas of book shelves with hundreds of books to read. Huge game room: it is ~12' X 12' X 50'! There is a driving range on one end and a ping pong table on the other end. Chess, backgammon, cribbage, scrabble, and many more. Stretch (8.5') beautiful Ohlhausen pool table. ~1000 sq ft of deck on the main level, wraps around entire front of home. ~1000 sq ft of patio (below the deck) with outdoor hot tub on lower level. 3 'Sky Chairs' are available in the summer. Rackets and balls available. Free use of private tennis court is about 200' away. 7 person outdoor hot tub on lower patio. Hot tub, 360 sound in all rooms (a bit outdated so bring aux adapter), raquetball/golf room, enormous kitchen, steamrooms, huge fireplace, putting green balcony. 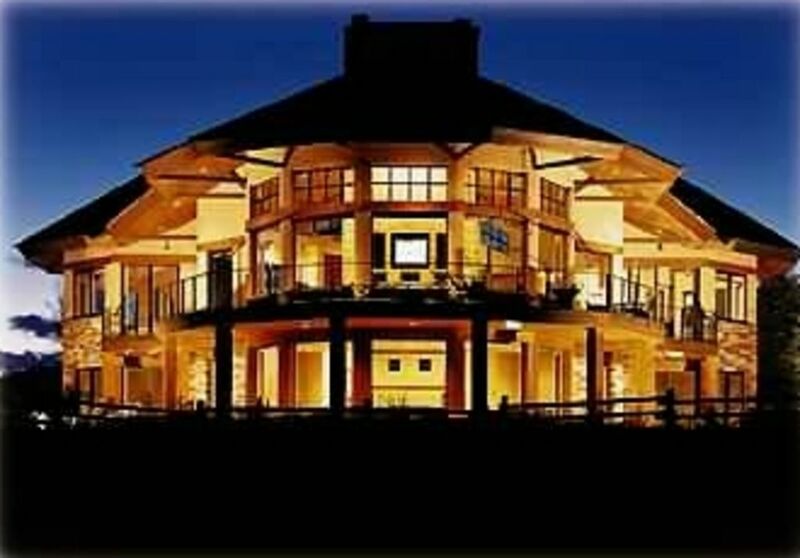 Dope crib fo sho. I wouldn't hesitate to stay here again. We stayed at this large home in the mountain village area of telluride with 3 other families for the bluegrass festival-- 4 couples and 7 kids. It was an easy free gondola ride down into town. The free ride service from house to gondola --2 mi--was reliable and fast. Impressive, huge views upon walking into main living area. Large master and bath on this level. Big kitchen with nice appliances, spices, cookware,etc. main level has powder room, large living room, double sided fireplace, and a surround deck we spent a lot of time on. Great sound system, no BT, plug in. We sat entire group at the dining table one night. The house has 1 floor up with large loft area (2 double and 1 single futons here and room for floor sleeping), 2 smaller bedrooms, and 1 full bath. Up a pull-down ladder is another tiny loft w qn bed. Downstairs 2 nice bedrooms, both w their own baths, another room w pool table, and another very big windowless "hanger" room w athletic equipment. Grounds are decent, but the views are over the top! Dennis is on site/available. We saw him only on arrival and departure. He was relaxed and easy to work with. A hammock chair broke during our stay and he was more concerned no one was hurt than the break itself. I have no misgivings about this place. We enjoyed our stay in mountain Village near the golf course. We drove to the gondola parking in mountain Village and took the gondola over to the base of lift 4.It was very easy. We had dinner in town each night. taking the gondola into town was very easy and a short walk to very good restaurants. The house came with Concierge car pickup throughout Mountain Village which we only used 1 time (2 of us arrived a day late because of our flight from Dallas to Montrose was canceled so our buddies were out on the slopes when we arrivesd) We used the van service to catch up with them. We cooked breakfast in each morning and found all we needed. The accommodations were great including the hot tub. This was our second stay at Dennis's house. The house was in great condition and Dennis was a perfect host. The only small issue was taken care of very quickly. The view from the house is amazing and can't wait to stay there again next year. Thanks Dennis! This home worked out well for our family group of 12. We also hosted our extended family during the days, and it accommodated all 36 of us nicely. We fit 8 vehicles in the driveway (no street or garage parking allowed). A free local shuttle is available and popular. The living room can easily seat 14+ adults. We sat 10 people around the dining table comfortably. The kitchen table seats another 6, plus another 5-6 seats outside on the partial-wrap deck, and another table with 4 seats in the study area off the living room. The kitchen includes a variety of cookware and eating/serving utensils. We especially enjoyed the 2 prep islands, each with its own sink. We also found the open counter to be well suited for serving buffet style meals. And the outdoor gas grill was fun to cook hot dogs and make s'mores. A large laundry/storage room next to the kitchen was perfect for organizing the dry goods. All of the above are on the main (entry) level, which also includes a nice sized half-bath as well as the main master suite with 2 (TWO!) private toilets and ample closet space. There is a mud room off the laundry room. A highlight is a live tree in the entry area, growing the full height of the house. Also the sky lights across the length of the home. Access to lower and upper levels is by staircase from main level. The lower level has 2 bedrooms: 1) a second master suite with its own laundry room, and 2) a large bedroom with adjacent full bath for common use. The lower level also has a pool table, a partial-wrap patio with hot tub, and a "sunken" game room with ping pong table and golf driving cage. All activities were abundantly supplied with equipment. There were even tennis rackets/balls for the neighborhood court less than a block away. The deck doubles as a putting range, and the living room coffee table had a built-in chess board. Upstairs from the main level are 2 bedrooms with dressers (no closets), along with 3 beds in the open loft area. A ladder in the upstairs hallway leads to a small rooftop access loft, with bed directly under the skylights for awesome star gazing. These all share one bathroom. The panoramic view is breathtaking from the deck, patio, and living room, and there are also great views from most of the other rooms. The owner was available via phone/text throughout the process and responded promptly to queries. FUN memories for our family! Thank you Carol, for your awesome review. It was great to hear that your whole family enjoyed all that my home has to offer. I especially appreciated the excellent care you took of my home during your stay. I hope to see you again soon. Fun property, amazing views and great for groups. This property was in great condition and perfect for a large family or multiple families. We enjoyed the amenities such as deck golf, ping pong and the pool table. The deck was a great place to hang out and enjoy the weather. The home was described well in the listing and I hope to come back for another visit. Thank you, Todd, for your kind review. We enjoyed having you and hope to see you again soon. There are no refunds starting 60 days before the start of the rental.